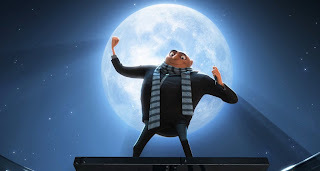 Essential plot rundown: Gru attempts to steal the moon in order to show his competence. This was an entertaining movie. I was laughing throughout. I only wished that I had seen it in 3-D. The roller-coaster ride looked like it would've been cool. Like I said, this is a pretty funny movie. There are a lot of funny lines. Actually, I felt it was the funniest when it stuck to dialogue. I thought some of the slapstick and other jokes fell kind of flat. I also really liked the story. I like how he wanted to steal the moon and how that was tied in with his childhood dreams. It really added to Gru's character. Not only was he trying to prove himself as a villain, but he was also trying to prove himself to his own mother. It really worked for me. However, I wished there would have been more reconciliation between the two. At the end, they are sitting together and his mom makes one little comment and thats it. I wanted that to be fleshed out a little more. And then there was Vector, Gru's rival. I liked his character; he was interesting. But, he felt a little inconsistent. I could never tell if he was a successful villain or a failure. There are scenes where he does stuff and it makes him look very good at what he does. But then there are scenes (mainly at the bank) that makes him look like a idiot. How could you steal a pyramid and get all those defense around his house but not be able to make a piranha gun work? I don't know, maybe piranhas are really tricky. It just bothered me a little. However, my biggest complaint was the ending. The girls are performing for Gru and his minions when all of a sudden it turns into a dance party. I just really hate endings like that. It totally ruins it for me. (I think one of the Shrek movies does it too). By having them dance, it shows Gru redeeming himself. But all of that just goes out the window when it changes tempo. The ending was building up only to have nothing happen. 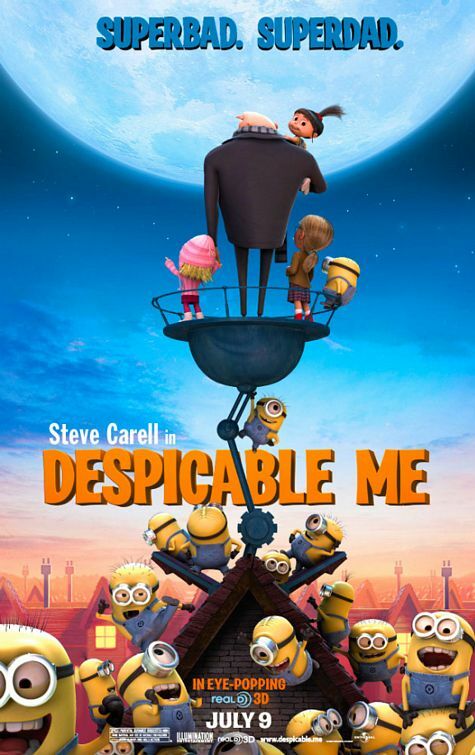 Overall, it was a really entertaining movie. I felt that the dialogue was hilarious; the other attempts at humor, not so much. True, there were some flaws that bugged me, but such is life. I would recommend it.